There's this one paper by Peppermint Granberg in this month's Gossamer Blue kit that is so pretty and has a stitched pattern look to it. Of course, I like to complicate things as much as possible so I decided to machine stitch over the heart patterns of the paper. The paper looked something like this when I was done with it (I still had to cut the strings). Photo is from my Instagram feed. I stitched the outer edge of all the hearts that wouldn't be covered up by other elements. Here's the photo about my girl who is amazingly everything to me. It's hard to see the details in the photos but it looks so freakin' incredible IRL. Did you notice how perfect my daughter's shirt matches the other pattern paper? The colors of her shirt actually clashed so I altered a couple of the colors using Photoshop. 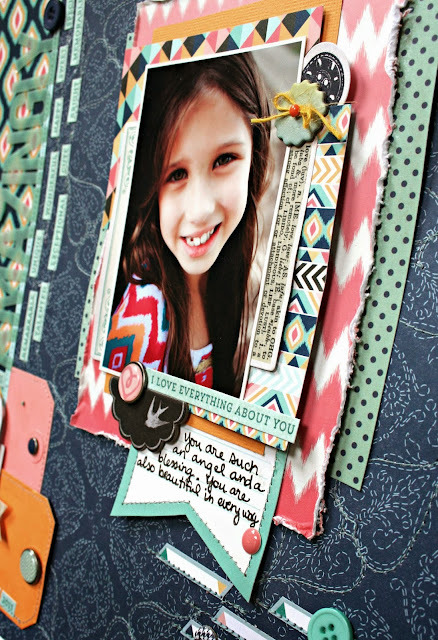 I used the opaque alphas by Heidi Swapp to create the main headline of the page and then stitched all the words that describe how amazing I think my daughter is. 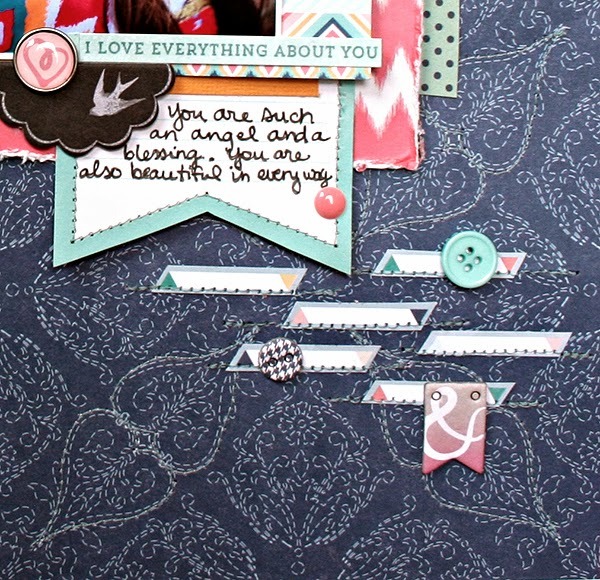 Lastly, I layered various patterns, journaling spots and embellishments to complete the page. 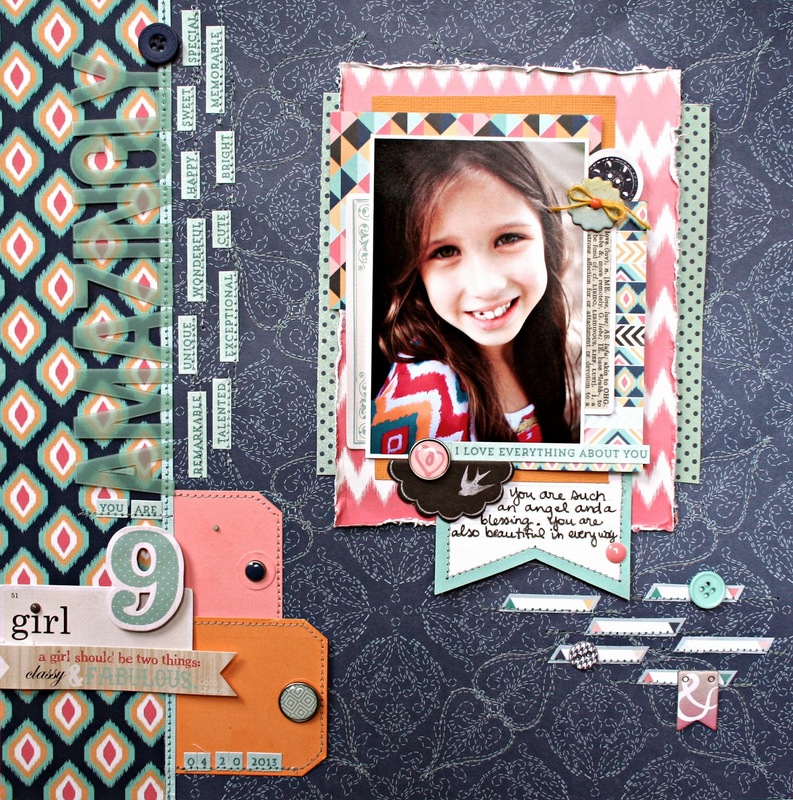 Head over to the Gossamer Blue blog for more info about this layout and the September kits. 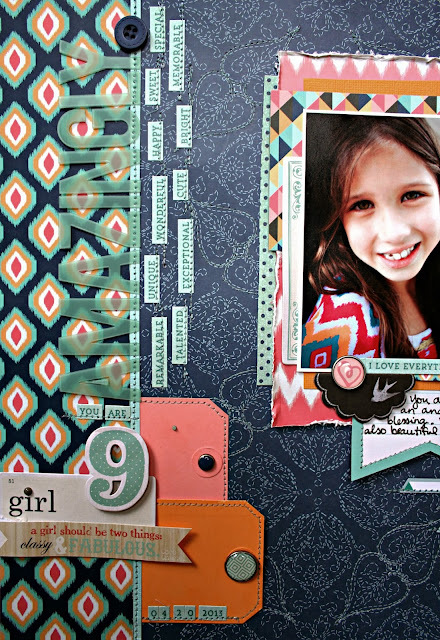 Love this page Heather, and the stitching over the pattern looks amazing! AWESOME sauce Heather--great work with the stitching and colors! 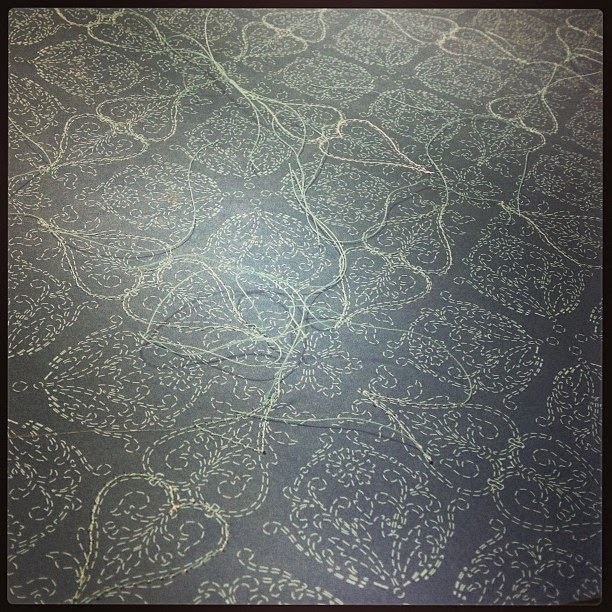 Beautiful stitching! Love how her shirt mimics the pattern on the left! My goodness that stitching is divine!!!!!!!!!!!! gorgeous page and amazing stitching! Love it! Aweasome Page,Superb sharing..Love to this sharing. what a great idea to stitch over the pattern. wonderful layout! Amazing girl! I love that added detail! And great idea to alter the colors if the shirt! What a fun page! Love the colors! !